Say goodbye to receiving a product that looks nothing like the picture. Say goodbye to receiving products that are larger or smaller than you imagined. And finally, say goodbye to wasting time returning items because it’s simply not what you expected. 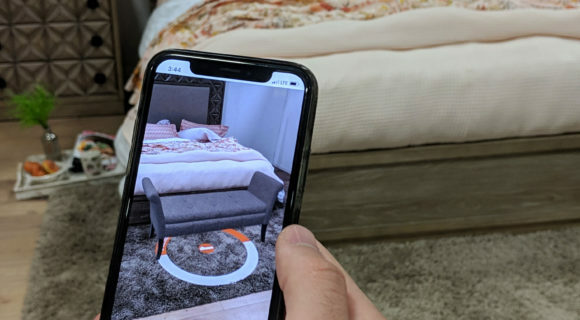 Join us in celebrating the launch of Furniture of America’s new App that brings furniture to life in your home using Augmented Reality. Available for free in the Apple App Store, the myFOA® App brings furniture inside your home before you make the decision to purchase. Simply pick the item you want, click “View in my Room”, then point your phone and see the item appear in your room. It’s that easy to make the right decision. So, what is Augmented Reality (AR) and why should you care? The short answer is: Augmented Reality is the future. AR is the blending of interactive digital elements being projected into real world environments. You may have seen AR in social media or mobile game apps. Snapchat with Face Filters is one example. Pokemon Go is another, which tested public reception of AR. Needless to say it was a massive success. And so we wondered, are online shoppers ready for AR? Early testing says YES! With the myFOA® app, you now have the power of Augmented Reality at your fingertips. It features our entire catalog of products and allows AR functionality of over 1,000 products, with more models added each week. It’s as simple as choosing a product, allowing your phone to scan the floor to understand the environment and scaling, and within seconds you will have a realistic 3D projection of the chosen product in your home. You can move the product, rotate it, and walk around it to see every angle. Moreover, myFOA® allows you to create a wishlist and send them to nearby local dealers. It even provides a list of services each dealer offers, and gives you turn-by-turn directions to your chosen dealer. Our goal was to give users the highest level of confidence prior to making a purchase. Customers love the ability to seamlessly see furniture in their own rooms before committing to a purchase; dealers, on the other hand, love our app because it can dramatically reduce returns. Augmented Reality is more than just smartphone fun. With applications in the medical field training and global advertising, the sky is the limit for AR. Soon you will notice the use of AR in everyday scenarios. After months of development, we are excited to bring you our interpretation of shopping made easy, only in the myFOA® app. This entry was posted on February 27, 2019 by FOA Team.